As the smartphone industry continues to grow and evolve in India, so does the app industry in India, as well as customer usage habits. A new report by Consumer Education and Research Centre and Chase India outlines some of the evolving app trends among Indian users, as well as identifying key high potential areas in the market. According to the report messaging, video streaming, music streaming, social networking and web browsing were the top 5 most popular app use cases among India users, with messaging being the most popular online activity of them all. In fact, Indians spent an average of 30 minutes per day on messaging apps only. However, perhaps the most notable finding of the report was the competitive nature of the Indian app market, with plenty of consumers opting to use multiple applications for similar activities. According to the data, 50% of users used more than one web browser, 42% used more than one online shopping app, 48% used more than one messaging platform, and 28% used more than one cab service app. This means that multiple apps are vying for customer attention in an increasingly cramped and cutthroat space. Now, this data perfectly lines up with recent app download trends in India. India has been witnessing explosive app download growth as of late, with almost 215% growth over the last two years. To put this in context, this is almost double the growth rate of China (125%), which is perhaps the single largest app market in the world. 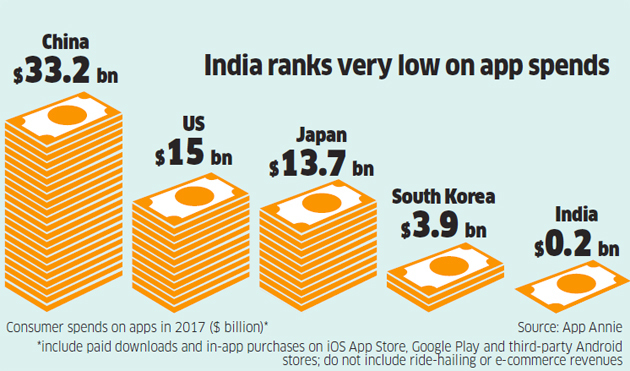 This growth enabled India to register 12.1 billion app downloads on phones and tablets in 2017, even surpassing the US at 11.3 billion app downloads. Another thing to note here is that India’s massive download numbers are not merely down to its large population either. It seems that Indian users are fond of maintaining a larger library of installed apps, with the average user using over 40 apps a month, out of a total installed base of 80. This puts India at the top of this particular list, ahead of even China. However, despite all of this, monetization remains a sticking point in the Indian app scene. Users in India only spent about $200 million on apps in 2017, compared to $33.2 billion in China and $15 billion in the US. This means that in-app advertising (banner ads, native ads, video ads) and in-app purchases remain the best revenue generation prospect for developers in an increasingly competitive market environment. Word of mouth and customer perception has become of utmost importance, with a whopping 86% of consumers stating peer reviews and word of mouth as the key influencers in their decision to download an app. Constant value addition and new features/content via OTT updates are vital, as well as catering to local demands and language barriers to keep the app relevant and at the forefront of the user’s mind.